Greek rockers 7he 7ouch are a new independent force on the UK rock scene, bringing a promising dose of hook laden, power anthems to the London circuit. With their debut EP Seventyseven set for release October 29th, the band have announced a run of UK tour dates to follow, which concludes at London’s Nambucca on the 12th of November. Full dates below. They’ve also shared another track from the EP named ‘Knobs’, which is an upbeat love song, exploring the internal fire you possess when meeting someone who can impact your life. “It’s an ode to those people that come into our lives and make us feel things that are kind of hard to explain and don’t necessarily need to be explained”, describes vocalist Constantine. It follows the previously released ‘My Face (Nanana)’, which is a catchy hard rock banger about overcoming rejection. Something that the band have all dealt with and many others can relate to. Experience and determination is a running theme throughout the Seventyseven EP, with all six tracks marking a moment in their journey so far that has bought them to London from their home in Athens, where they left amidst the country’s financial crisis in a bid to follow their dreams. 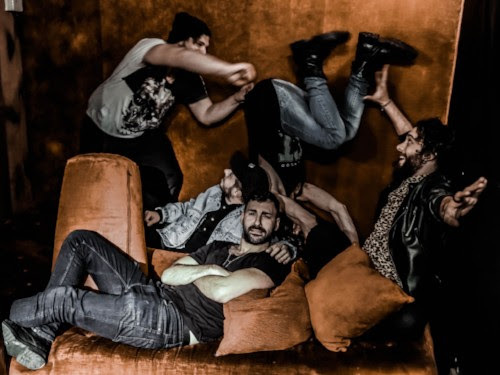 The band formed of Constantine (vocals), Stelios (guitar), John (lead guitar), Toni (bass) and Dave (drums) bring together influences ranging from old school rock’n’roll through to nu metal to create a sound that is powerful, raw and undeniably catchy.